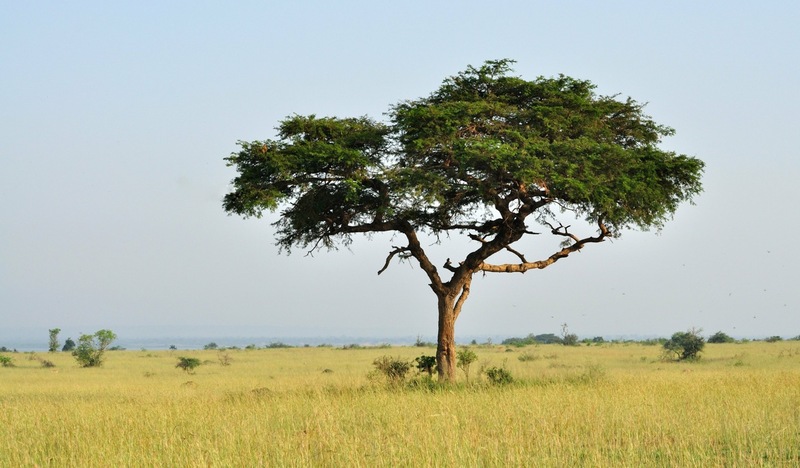 For those putting on African style games nothing is more iconic than the Acacia tree. 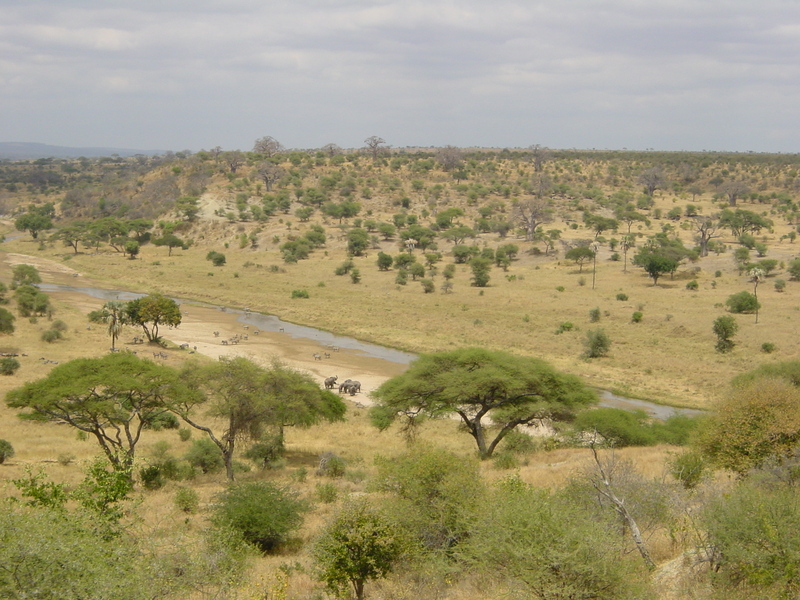 Along with a giraffe, hyenas and the like, getting the ‘look’ of an African table is helped immeasurably by putting down some acacias. Unlike many other trees they are so distinctive with their flat top and little ‘low growth’ branches (that giraffes so love to eat), you can’t substitute too much else in if you want to achieve this look. 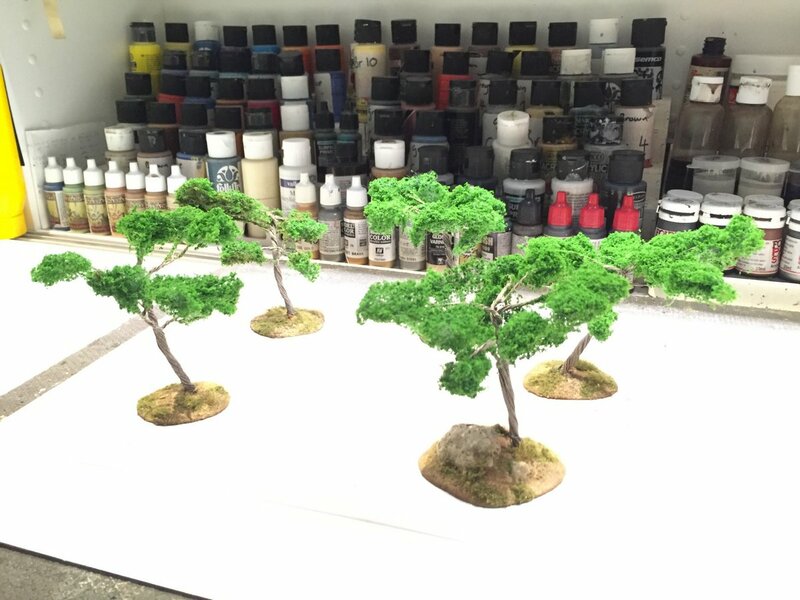 You can order some pre made trees from specialty manufacturers or have some custom built or indeed try your hand at making them from scratch – all rather expensive and a lengthy process. I wanted something quick and easy that would be pretty robust and not a precious terrain piece. Trees generally take up a fair bit of storage space and if you need a few of them then storability is a factor if you want more than just a few. So with that in mind I got to sniffing about ebay for suitable wire trees that would bend into shape and be cheap and easy to get. I think I found a couple suitable candidates that might prove useful. Getting them flat packed in the mail they were relatively simple to bend into shape to create a flat top look. Whilst there only appears to be one size (as far as I can find online) they work admirably for 28mm figures. There was a little bit of wastage with the flock falling off but I think this will pass once it used a few times. 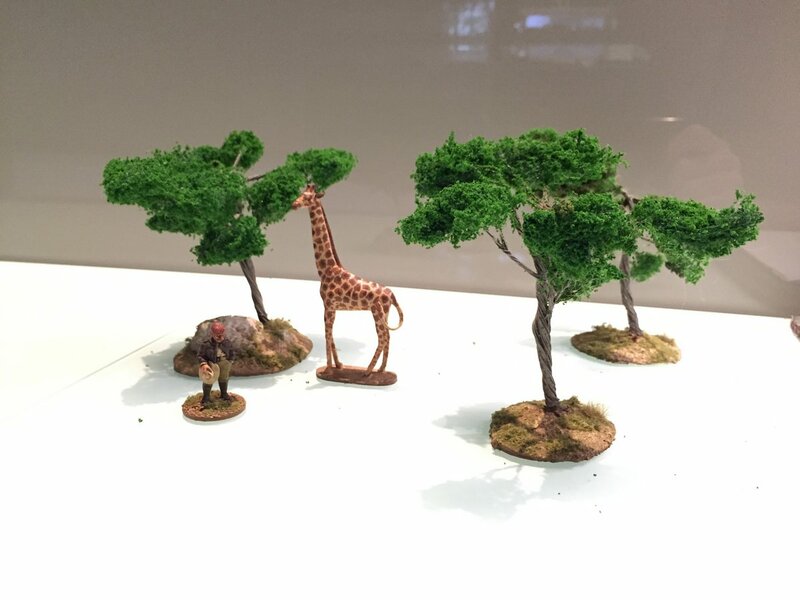 Alternatively you can ‘seal’ the flock on with something like the Woodland Scenics flock spray or maybe even white glue…something like that. The trunk is made from wire and is prepainted though I found it’s best to just hit it with the same colour again and make sure the metal is completely covered. Before doing that however, if you want to achieve the ‘true’ flat top look, you can snip off the lower branches and leave just the tall flat top branches to give the acacia look. 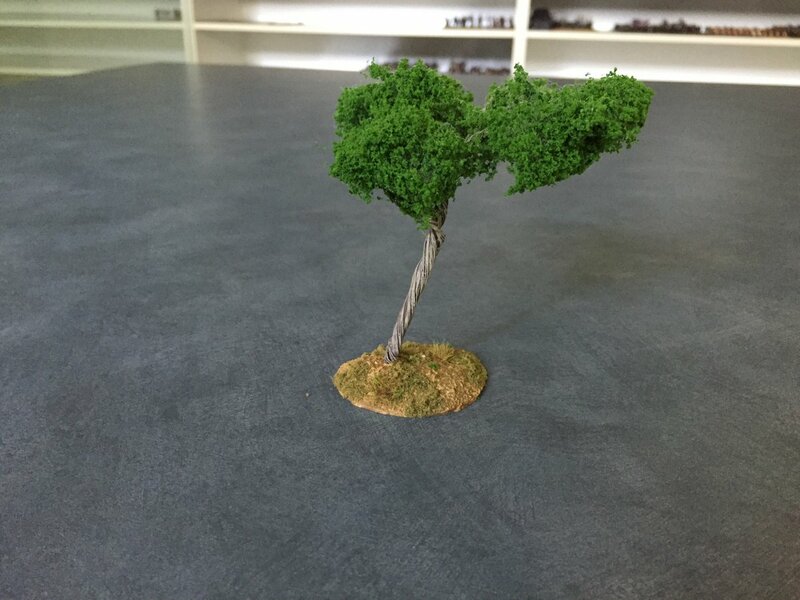 I glued the lower snipped off branch and attached it to the trunk on top to flesh out the top of the tree…a useful way to get a flat top look from the same model. Here the lower branch has been removed and glued on top. Then a quick dry brush and the tree trunk and branches ‘pop’ nicely for very little effort. 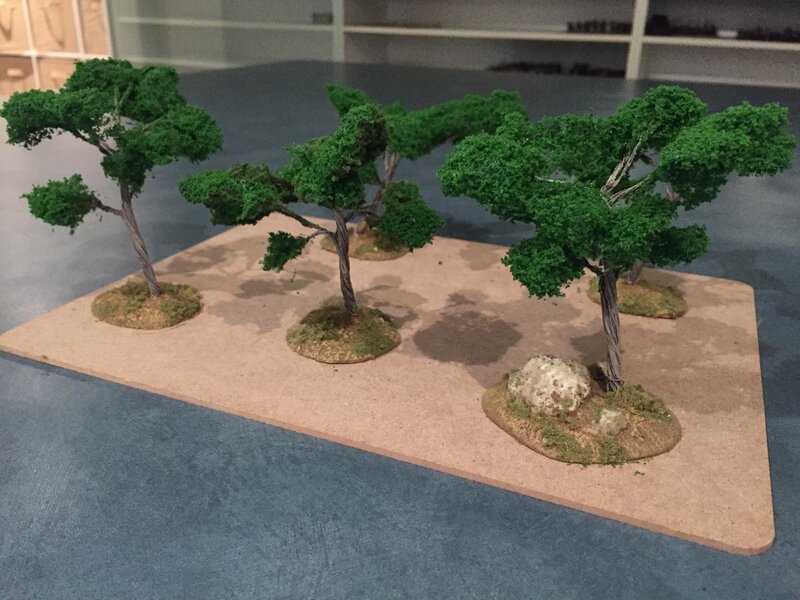 I secured the trees with some bases I picked up a while ago and I’d suggest that something the tree trunk can be secured in to (via a drill hole) which will make the final item tough enough for gaming use and ‘chuck in the box’ storage. Drill the holes at an angle and off to the side to get the centre of gravity over the middle of the base and still achieve the characteristic ‘leaning’ which helps impart its distinctive acacia look. On some of the trees below I have left the lower branches in place but the pic above shows the lower branch clipped and repositioned ‘on top’ as described. So there you go. Super simple and cheap acacia trees that are easy to get and put together for a more “african look’ to proceedings. The trees in question can be bought here and here.